Replacing chandelier crystals, prisms, and/or a chandelier’s glass parts is easy and straight-forward most of the time. Most existing chandeliers, table lamps, and even wall scones will have at least a few crystals left behind, though they may be damaged or need to be cleaned. Carefully examine and measure one of the remaining crystals, then determine if you need to replace all, or only some of the crystals. If most of the crystals are missing, you may be better off replacing them all of them. The most important step in restoring your chandelier or fixture is to find a good source of replacement crystals that match your old ones, even if you plan to replace all of them. In most cases, the original style and size of the chandelier crystals is going to look best with your particular lighting fixture. If you only need to replace a portion of the crystals, you may also want to consider the finish of the hanger pins that hold the crystals together and allow you to pin them to your fixture. We offer an antique or “aged” finish on the metal hanger pins of many of our most popular designs in crystals, pendaloques, and lamp prisms. These chandelier crystals with antique brass pins will better match older existing crystals than new ones with a shiny finish on the pins. This crystal is commonly referred to as a U-drop prism, and it is most commonly associated with Library Lamps of the Victorian kerosene era. This particular lamp crystal is clear and has a body length of 3” (not including the top bead), but is available in smaller and longer lengths, and several different colors. The U-drop prism is comparatively inexpensive and very versatile in application. They may be used on hanging fixtures, sconces, table lamps, and even some candle sticks. Available with brass, antique brass, and chrome finished prism pins. Same applications as the clear U-Drop prism above except in true glass colors (not stained or painted glass). These traditional prism colors are a great match for some early hanging-type lamps and fixtures. They also look great on festive holiday decorations, including wreathes and Christmas trees. Clear, Full Cut Almond Pendalogue. These inexpensive chandelier crystals are useful on a variety of projects, and come in sizes from 1 1/8” to 3”. Available with brass, antique brass, and chrome finished prism pins. High Quality Clear Cut Spearhead Prism. 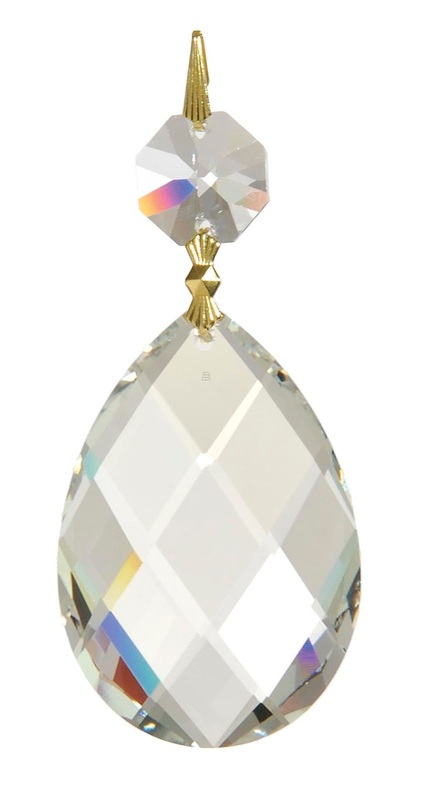 The spear cut prisms were originally produced for fine, British and early American lusters, cut crystal candelabras, mantle ware, and top quality crystal chandeliers, some of which pre-date the kerosene era. Available with brass or chrome finished prism pins. Clear Colonial Crystal Prisms. These hand-cut and polished lamp crystals have a similar application as the Spear Cut prisms above. Available with brass, antique brass, and chrome finished prism pins. Clear Glass “Pencil” Prism Crystal. 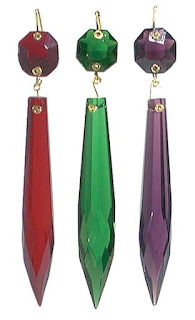 Available in many colors and lengths, pencil prisms work well on crystal and metal bobesches, and made be used in tight groups as a lampshade or light diffuser. Available with brass or chrome finished cap & loop. Clear French Flat Crystal Pendalogue. These beefy chandelier crystals lend themselves nicely to larger crystal, bronze, and darkly finished iron fixtures and chandeliers. 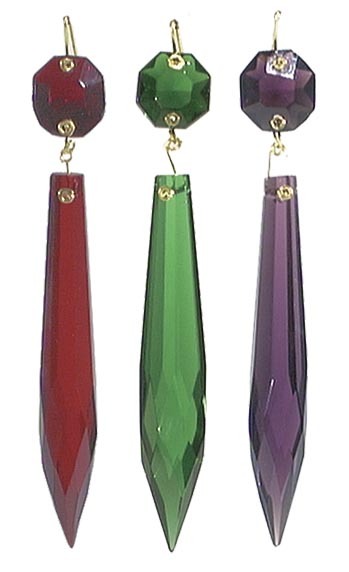 Available in lengths of 3 1/2” to 6”, these prisms are hand cut and polished. We offer many large chandelier crystals that are often required for oversize fixtures. Clear Strass® Swedish Almond, 30% lead crystal. 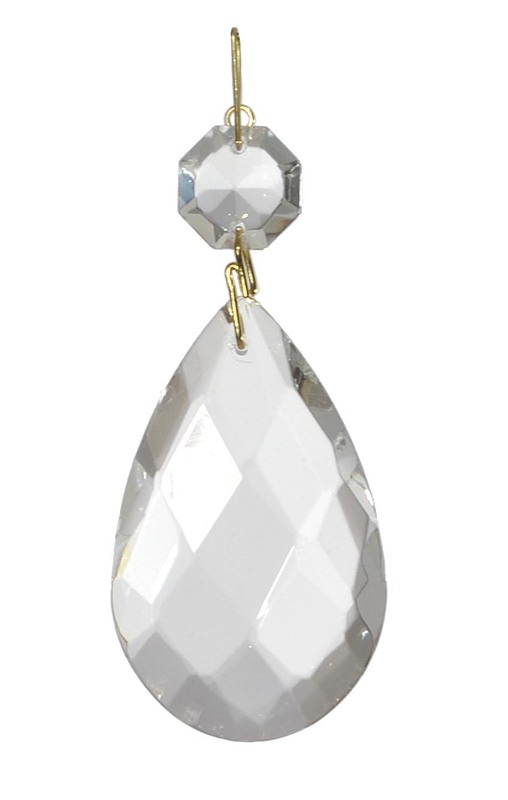 We offer dozens of styles of Strass® brand leaded crystal that are among the finest chandelier crystals in the world. We also offer Strass® brand replacement parts (beads, bow-tie hangers, and crystal bodies) that allow you to re-build damaged Strass® crystals. Clear Rock Crystal Full Cut Almond. These rock crystal chandelier crystals were originally used in the earliest days of indoor lighting when hanging fixtures were typically lighted with candles (i.e. before kerosene or whale oil). 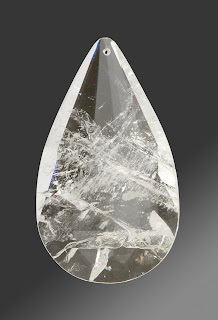 This rock crystal is actually a semi-precious, colorless stone that is quarried, then hand cut and polished. These are mainly intended for use on high-end fixtures and sconces.